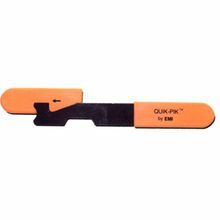 Quik-Pik Door Knife Quickly open locked doors by retracting the bolt. Often a credit card will not have the bite or stiffness needed to retract the bolt. This is where the Quik-Pik shines. Can use on doors that open in or out. If the door opens inward; you insert the Quik-Pik� in the back of the molding stop and retract the latch. For doors that open towards you, Quik-Pik� is slipped in from above or below the latch point and jiggled and pulled to retract the latch. Can be used to leave no damage to the door. Especially good for doors with the lock in the door knob. Many EMT, police and fire departments routinely carry this in their equipment.